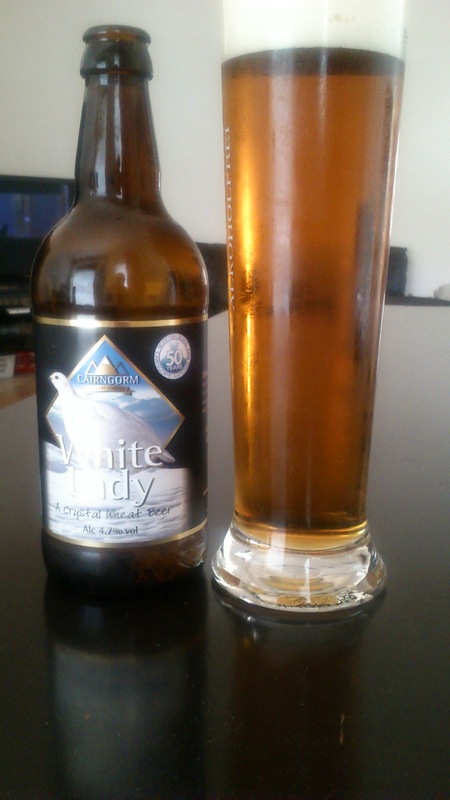 Scrapping the Cairngorm alphabetical order, it's too hot today for Trade Winds and Wildcat to finish the range...A bonus beer as I was in Abigails British food shop in town during the week and they had a good few of the Cairngorm range in. White Lady pours a clear dark orange to bronze colour with a medium white head. I do get the orange peel and coriander mentioned on the label blurb along with wheat and roasted malts on the intake while it finishes slightly bitter with coriander and lemon lingering in the aftertaste. If blindfolded I would never guess this was styled as a german weiss. It comes off as some kind of hybrid between a wheat beer and I don't know what. I quite enjoyed it all the same and would no have no problems having to drink another. This scored 4/10 on my 'what the hell is it ?' beerometer. Where to buy CPH : Abigails have it in their shop in town.